Here's a great resource for someone who wants a list of health studies related to unconventional drilling. A few days ago the Concerned Health Professionals of NY and the Physicians for Social Responsibility released their third edition of the Compendium of Scientific, Medical, and Media Findings Demonstrating Risks and Harms of Fracking (Unconventional Gas and Oil Extraction). "The Compendium," say the authors, "succinctly summarizes key studies and other findings relevant to the ongoing public debate about unconventional methods of oil and gas extraction." It will be useful for people who want to "grasp the scope of the information about both public health and safety concerns and the economic realities of fracking that frame these concerns." For those who want to delve deeper, there are plenty of references to reviews, studies, and articles. Readers wanting more can dive into this fully searchable citation database of peer-reviewed journal articles pertaining to shale gas and oil extraction housed over at PSE Healthy Energy. The report highlights health risks ranging from air and water pollution as well as risks associate with a newly emerging problem: leakage of methane and other toxic gases from compressors, pipelines, and other infrastructure. In a letter to NY governor Andrew Cuomo and NY Dept. 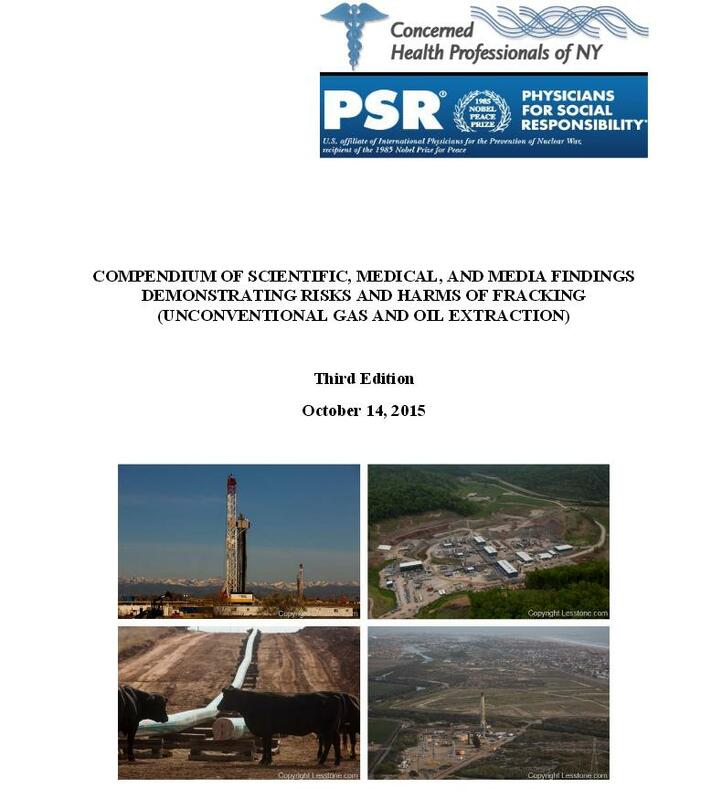 of Health commissioner Howard A. Zucker, the authors of the study note that more than 100 new peer-reviewed studies on the impacts of drilling and fracking have been published since New York’s high volume fracking ban was announced in December 2014. They state that the evidence compiled in their report makes clear that residents of New York (and other places) are at risk from gas infrastructure projects. "As with hydrofracking, the evidence available to date confirms that New York’s DOH and DEC were right to note the potential for harmful air impacts, environmental impacts, and other risks from infrastructure," they write. "Compressor stations and pipelines are both major sources of air pollutants, including benzene and formaldehyde, that create serious health risks for those living nearby while offering little or no offsetting economic benefits." Compressor stations in particular, are pretty much permanent facilities that pollute the air 24 hours a day with emissions and noise. The health professionals cite particular concerns over a maintenance procedure known as "blowdown", which can last for hours, releasing plumes of gas into the air. These have been associated with short term effects such as nosebleeds, burning eyes and throat, skin irritation, and headache, and the health professionals are concerned about long-term effects such as asthma, heart disease, neurological effects and cancers. The authors of the Compendium noted, in their comments to the press, that "the pace at which new studies and information are emerging has rapidly accelerated in the past year and a half: in the first few months of 2014, more studies were published on the health effects of fracking than in 2011 and 2012 combined." More than 80 percent of the available studies on the impacts of shale gas development have been published since January 2013, they say. In 2014, 192 peer-reviewed studies on the impacts of fracking were published, and in the first six months of 2015, another 103 studies appeared. "Given the rapidly expanding body of evidence related to the harms and risks of unconventional oil and gas extraction, we plan to continue revising and updating the Compendium approximately every six months," say the authors, noting that the studies cited in this third edition are current through July 31 of this year. So, who funds this Compendium project? No one. The group states that the Compendium is written "utilizing the benefit of the experience and expertise of numerous health professionals and scientists who have been involved in this issue for years."